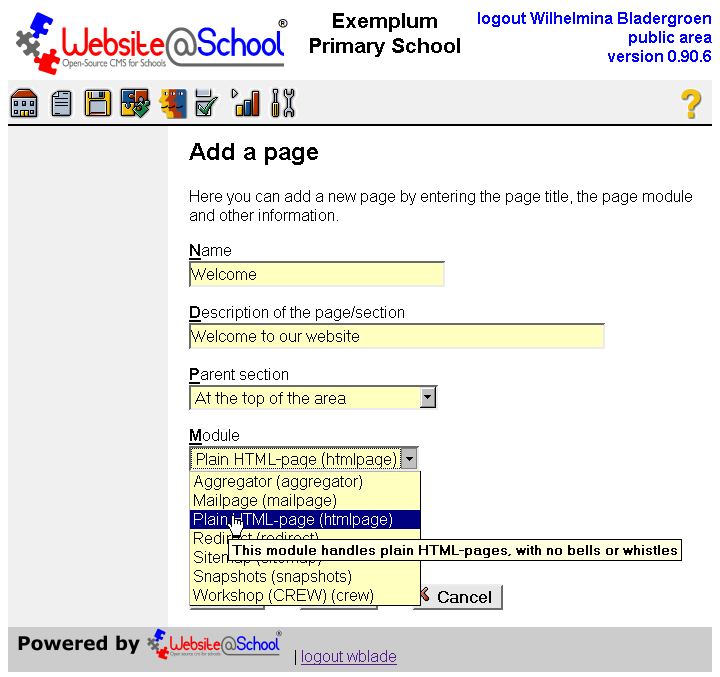 With the HTML page module, you create a page with a User defined editor. The nodule needs no description. Fill out the fields and, in the dropdown menu Module, select the Plain HTML-page module. Do not forget to select Visible, Hidden or Embargo. Click [Done] to save your work and return to the Page Manager. The module can be configured in two places. The most important one is the content, discussed below. In paragraph 3.2 we will briefly mention the advanced options and some links. The User selects the content, i.e. the editor, by following: Acoount Manager > Useers > <username> > pencil icon > Edit user <username> ( User Name) > dropdown menu: Editor. Several editors are available. Please check the Editors chapter for further details on the available editors. The advanced options also apply to this module. In particul it means that you can use Bazaar Style Style (BSS) to get rid of awfful colors that mismatch with the school site or with the pictures on the page. More on the practical work can be found in Configuration Manager, paragraph 3.4 Configure theme 'Theme Name' for area n. The other advanced options are discussed in chapter , paragraph 3.3 Advanced: edit advanced properties of page nn.